Nick Soup: SQUEEZE that Rocket Juice! 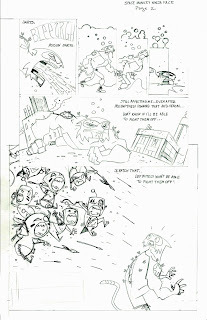 As promised, here are the first two pages of Space Ninja Monkey Face. I'm really pleased with these so far (page 2 still needs some work) and I was surprised to see that drawing these pages was not at all like pulling teeth. 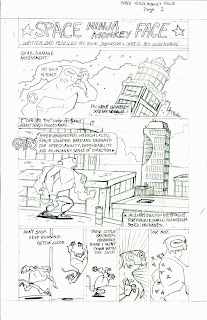 I'm trying to focus on the basic shapes and composition of a page before actually committing to the details (in fact, I've been trying to do that for the last couple years) and it seems like it's starting to pay off. And it may be tons more work, but I'm going to do all of the lettering by hand for this one, though there is the risk of the pages looking a little more sloppy. But I really like the look of hand lettering (especially after seeing work by James Stokoe and Sheldon Vella) and I really want to train on how to make it better. If anyone has any tips, I would love them. The tips, not the person. Well, both. And now I get to sit back and watch Cognoman work his magic:) I'll post a finished page as soon as I've got one. Cool panel design on the top of page two. Thanks guys. I'm really trying to have fun with this and I think it's starting to show.